To celebrate the release of my new vampire thriller, A Good Man, take this super fun trivia quiz to see how well you think you know me and my books. Hint: even if you've never read the books, you can find all the answers on this blog. Comment below with your test results. If you get everything correct, you will receive a copy of A Good Man. 3. Which French reality TV star plays one of vampire's Louis Caron's victims in the movie adaptation of A GOOD MAN? 4. Which paranormal ability does Vanessa want to possess? 5. Who is slated to direct the movie adaptation of A GOOD MAN? 7. Wich one of Vanessa's books was called 'the scariest story of the year'? Louis Caron is a good man. Vegetarian, he feeds the homeless, takes care of animals and is concerned with the ecological future of the planet. But Louis has a sinister edge - he's a vampire - and local detective Taglioni is getting increasingly suspicious. Louis' attempts to escape the police will take him a journey into his own private hell where he is not only forced to confront his worst fears, but also to destroy the lives of those he cares about most. I need to change my number one answer to Belgium, please! And I'd go for Drowned Sorrow as book of choice. Love the covers. Now, im really excited to read the books. A GOOD MAN would be my choice! It was really funny to find out so many thing I didn't know about you or the books! I would like to read The Strangers Outside. Thanks so much for the trivia quiz! Loved it. I would like A Good Man! Thanks! I'd like to read A Good Man. Thanks for the chance! You tease! I so want your books RIGHT NOW! I just discovered your work today and I am really excited to get to read your stories. 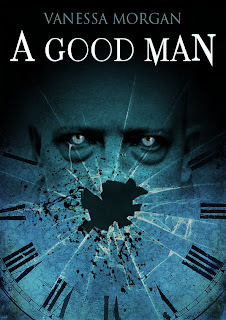 [A GOOD MAN] sounds really interesting-- I'd like this please, if possible. And how amazing is it that it's going to be a movie. You must be so excited! By the way, I'm sorry I couldn't comment under my google account, but something's going on with that. I hope this doesn't exclude me. I. NEED. THESE. BOOKS. RIGHT. NOW. OTHERWISE. I. MIGHT. TURN. INTO. A. ZOMBIE. I would like to thank you for a fantastic book giveaway, and i would love to have the oportunity of reading & reviewing 'a good man'. My answers to your questions are listed below. I love that you love cats too! I have currently have 3. 5- a Steve De Roover. 8- Monks. 9- Cat. 10- Vanessa's cat. My iPad made me post this out of order! Just bought A Good Man! Can't wait to read it!! And I'd go for A Good Man as book of choice. Hi Vanessa! I love this, so unique! Hiya, I just stopped by after visiting the Naptime Review Blog Hop! What a fun idea this trivia quiz is - I am going to give it a go on my blog! I am your newest follower on Google Friends. Hope you can stop by my place too! hi. was fun reading your quiz and the answers. glad oi knew most of them before even reading the comments below. do keep up posting more such activities.. I would love to read "The Strangers Outside"! Follow on GFC as Sharon Braswell. Follow on Google + as Sharon Braswell. Following on Facebook as Sharon Braswell. I'd choose A Good Man. Oops! I'd like Drowned Sorrow, if I win. I would like A Good Man! I would like the book The Strangers Outside. I would choose A Good Man! I'd like a Good Man, please! A good man sounds neat.